Today I got the last pieces of artwork from my Sister-in-Crime, Carol Phillips for LoE Book V: The Temple of the Exploding Head. Book V is done, now just to get it formatted and on the shelves and its history. Looking back on it–what an undertaking TOTEH was. It is, by far, the biggest and most complex story I’ve ever attempted to write, and, prior to The Shadow tech Goddess, was the most grueling, most time-consuming manuscript I’ve ever written. It began, literally, with nothing but a title and underwent massive changes several times during its maturation to the point that I was ready to pull my hair out in frustration and delete it altogether. So, what follows is a commentary and revelation on many aspects of the story as they came and went and you’ll bear witness to the story and characters from its tentative genesis to its current incarnation. I began working on TOTEH in early 2008. Usually as I get to the last quarter of a manuscript, I begin wondering about the next book; what is it? What will it be? Will there even be a next book? I normally find myself bereft of new ideas as I end a manuscript–it’s like the gas tank is totally empty. As I finished up Sygillis of Metatron, I fretted over The Hazards. Likewise, as I finished The Hazards, I wondered what was next. Surely Carahil’s saving of Xandarr wasn’t the end of the LoE universe–was it?? Little things I encounter cause big inspiration and my mind turned to a tale I called “The Shadow tech Goddess“. I liked the title, but was having issues formulating a story for TStG so I set her aside (I would set her aside two more times before finally settling in and writing her story). I remembered loving an AD&D adventure called “The Temple of Elemental Evil” that I played in college. I never forgot the name, it stuck with me through the years. Eventually the “Temple of the Exploding Head” entered my mind. I had no idea what the name meant, I just liked it. So, with nothing but a title, I opened a new file one day and began what would eventually become a 450,000 word manuscript taking a little over a year to form into a first draft. The Cursed Captain Plotline: I started the manuscript having no plot. I knew I wanted to move on from Captain Davage and Syg a little, so I decided upon centering the story on their son, Lord Kabyl who was first mentioned in Book II. I floundered about for months. One of the issues I had was something I’d never encountered before: publication. As Sygillis of Metatron was going through publication I found the process was swallowing up much of my time. In fact, I often went months without even looking at TOTEH. I found myself growing distant from the story and disinterested. The initial plot I came up with was that an unknown group seeking revenge placed Captain Davage into a Death Curse, and it was up to Kay and his cousins to uncover the perpetrators and save Captain D. This “Cursed Captain” plot-line was how I initially structured the story. The Machine Plotline: “The Machine” plotline eventually won out and drove the story. However, the Machine itself was very late in coming and didn’t exist as a concept until many drafts into the story. The Machine plot-line felt right and I cast aside the “Cursed Captain” in favor of it. It took me forever to figure out who the bad guys were. Bethrael of Moane: My first thought was to make good-guy Bethrael of Moane the main bad guy of the tale. My thought was that Beth had secretly been in love with Captain Davage for years but never could make any headway with him as he was with Syg. She then decided to court Captain Davage’s son, Kay, and when he rejected her for Sam, she lost her mind a little. The oiled, feathered High Priestess seen in the Temple at the beginning of the story was originally Beth. But, I couldn’t do that to Beth, so I discarded that idea and let her remain a good guy. The one remaining vestige of her sexual connection to Kay is the touching of her Silver tech which drove her into a frenzy. The Horned God: The Horned God started out life as a benevolent elemental spirit of lightning who had been summoned by the Kestral Oligarchy and forced to do bad things. In the first drafts Carahil and the Horned Gods were friends, though they served differing factions. I found the Horned God to be unbearably boring, so I eventually “upped” the voltage and made him one of the main bad guys of the story soaked in evil. Killanjo: The skinless and gross henchmen of the Kestrals, the Killanjo started out as mere apparitions. A Killanjo was spell cast upon a person by a practitioner skilled at focusing their mental energy. The Killanjo once cast, would sit invisibly on the shoulder of the victim and attack later in their dreams. Sam, in the first draft, was skilled at creating Killanjo and she was to place a Killanjo on the shoulder of Captain Davage. As I abandoned the original incarnation of the story, I kept the concept of the Killanjo, transforming them into grotesque, skinless monsters. The Kestral Oligarchy: The Kestrals have been around since the beginning as rabid, golden-skinned inhabitants of the Temple. At some point I turned them into aliens with unknowable logic and an undecipherable language. As I settled on the Horned God as the Main Bad Guy, they sort of fell by the wayside, but then I had a moment of clarity and added the Kestral’s horrid City of Many Forms and they peaked my interest at just the right time. The Spectres: “Punks” from Xaphan space and Black Hat underlings, the Spectres once played a much more active role in the story being a usual antagonist of Kay and his cousins. Sam herself was a Spectre at one point. But, as the story evolved away from the “Cursed Captain” plot-line, the Spectres were mostly cut out. The Circle of Five: The what???? The Who???? The Circle of Five was to be the main bad guys of Book IV. A criminal element pervasive through the League the Circle was the mysterious group responsible for the “Cursed Captain” plot-line. When Sam led Kay into Grove, she was originally leading him out to meet the Circle of Five. I could never get a good feeling for the Circle and I discarded them in favor of “The Machine” plot which eventually drove the story to its conclusion. I did reuse the names of the Five for the various Black Hats seen in the city of Waam in Book IV. 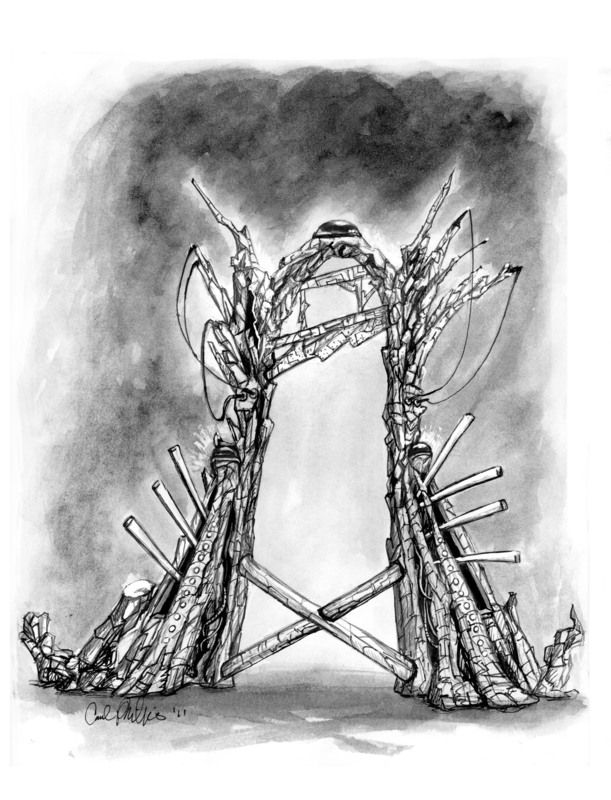 So, for a long time, Book IV was known as “The Trials of the Circle of Five”. The Monamas: The Monamas were initially minor bad guys doing the Circle of Five’s bidding. They weren’t black-eyed and clawed at the time–they looked like anybody else. However, as I transformed Sam into a Monama, I also added their unusual appearance and attributes. The Bersekacides: Berserkacides started life as typical zombies. As I modified the Monamas into alien creatures, I also added to the concept of the Berserkacide. Kay: A storyline that cropped up in The Hazards of the Old Ones” was Syg’s pregnancy with a boy they would one day name Kabyl. I decided to focus the story on Kay and make it a coming of age story. I wanted to make Kay flawed and imperfect, an odd counter-point to his formidable parents. Lt. Verlin: I initially planned to make the Marine Lt. Verlin Kay’s love interest. With that in mind, I decided to add a chapter to Book II discussing Lt. Verlin and some of her history in detail (Lt. Verlin’s Hero). The problem was I couldn’t make Kay and “V” gel–it was like a bad date you want to be over. I tried and tried and eventually gave up. I wrote V out and never looked back. Thanks to Sarah of Blanchefort, I continued on and finished the MS.
Sarah: I came up with the idea for the feisty but loyal Sarah after watching actress Sarah Bolger in “The Spiderwick Chronicles”. Oddly, it the was insertion of Sarah into the book that really reignited my interest for this storyline. I’d become rather put off by the MS and it was the addition of Sarah that got me going again. Phillip: I modeled Phillip after San Diego Chargers quarterback Phillip Rivers. Don’t ask me why, I just did, end of story. Lt. Kilos: The presence of Lt Kilos was a big comfort for me, like wearing a comfy pair of shoes. 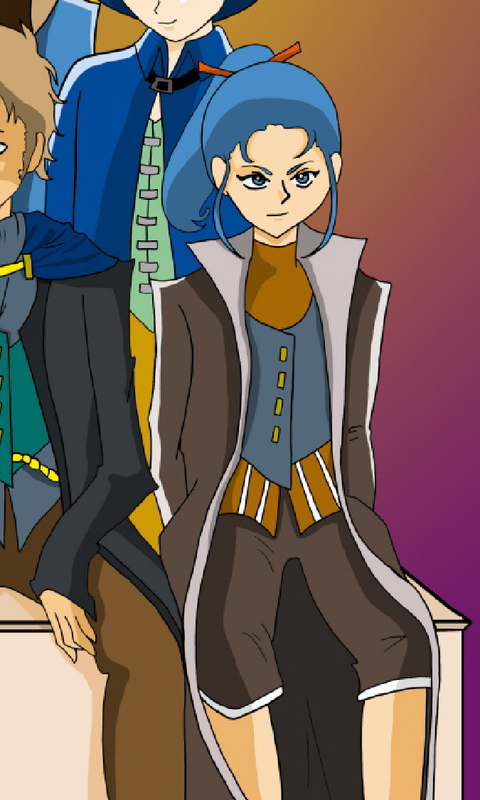 In the Cursed Captain plotline, she was sort of a background character and stayed with the dying Captain Davage. As I made the change to The Machine plotline, I decided I wanted Ki standing at Kay’s side, and hence the big fight at the bar that will be seen in Book V.
Captain Davage/Syg: Captain Davage originally spent most of the story flat on his back, dying from a mysterious curse. Syg, seeing her husband dying, lost her mind. I restored his health in The Machine plotline and he and Syg conduct a parallel investigation in the background. 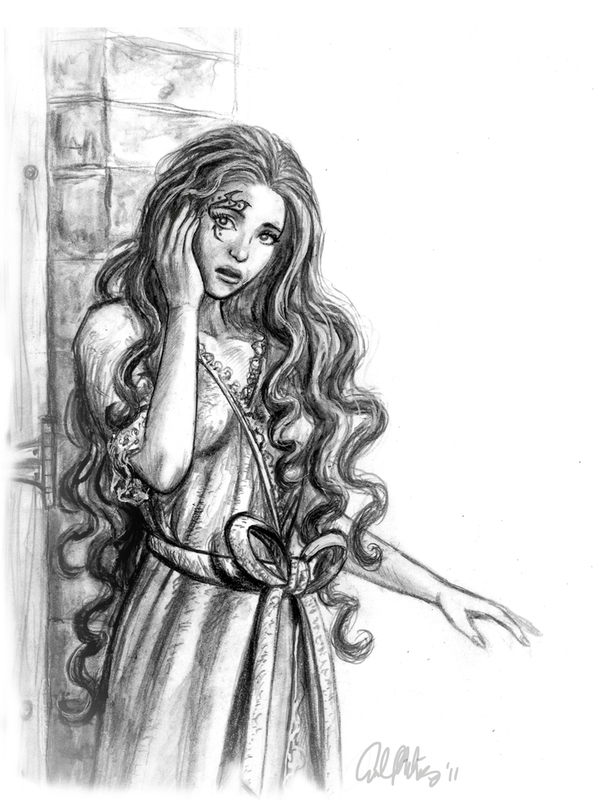 Thomasina the 19th: Thomasina existed in the story for a long time, especially during the “Cursed Captain” days. After I abandoned that plotline, I had no idea what to do with her–I even considered cutting her for a while. Eventually, it occurred to me to take the demure church-going woman from Saga and change her into a slightly crazed, green-haired Xaphan woman. Sam: Of all characters, it was Sam who underwent the most radical and all-encompassing changes from beginning to end, such that she is unrecognizable from when I started. Sam did not begin life as a powerful Monama princess, quite the opposite–Sam was a lowly servant in a Calvert laundry room with bad eyesight. I actually liked Sam as she was and I was heartbroken to cut away her best scenes hauling laundry and transform her into a clawed, black-eyed Monama. (I resurrected Sam’s original look with Joy–the Black Hat staying at Aunt Pardock’s castle. Joy looks exactly as Sam once did). Her shy nature also resembles Sam’s. I’ve added a selection with Sam in her original incarnation in the FREE SECTION, so, if you want to see Sam as she was, give it a read. 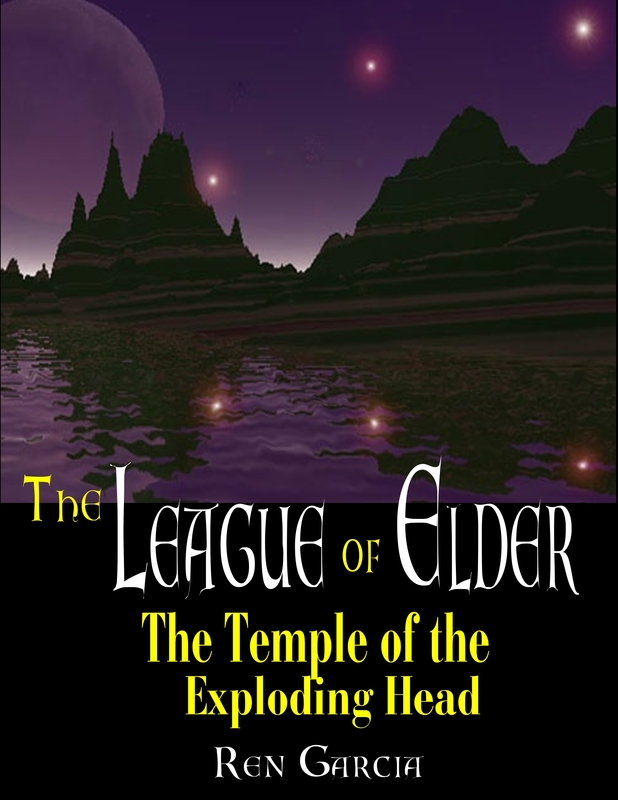 Book V, The Temple of the Exploding Head, will be released in early 2012 by Loconeal Publishing. Every writer, everywhere eventually faces moments of trouble–there’s no getting around it. The issues writers face can be truly vexing, be it Writer’s Block, Writer’s Corner (or writing one’s self into a corner) or, that most daunting of Foes: Procrastination. A completed written work is a testament to perseverance, to overcoming the blank screen and the heavy eyelids, the burning pot on the stove, the exciting football game on TV and focusing on the task at hand. Ren asked me to relate a time when I encountered a roadblock to a project. Wow, he must be living next door. Every time I write it’s a problem trying to come up with what to write next. The issue probably relates to how much I utterly hate plans. In story lingo that’s called working without an outline. I’ve always been this way. I used to play my guitar on open stages. My approach to writing songs was to write them entirely in my head then get up on a stage and for the first time, see what they sounded like while everyone looked at me. Practice singing the thing? Are you kidding me? That could prove embarrassing. No way did I want my family seeing that. I’m an anti-plot person to the extreme. Everything I write is experienced by me just like it is by the reader: A complete and utter surprise. Somehow this works for me. Many a time I’ve written a scene, only to sit back and smile, saying, “Oh, so that’s what happened!” Without those moments, writing wouldn’t be nearly as fun. My view of writing is kind of like those old electronic football games. You know the kind with the vibrating fields. You wedge the wax football under your main player’s arm, set him on the table and hope he at least goes in the right direction and doesn’t fall over. Take what I’m writing right now. It’s called The Condotte’s Daughter, a gun toting, fantasy, romance adventure. The book features a young lady who is erroneously drafted into the all-male army of a warlord, but who’d rather just go home and start her life. I am 60,000 words into it and I swear to the Goddess, I’ve been clueless regarding where the story is going more than two pages ahead for the whole thing. Finally, at 60,000 words, last week, I had a brain-fart and saw the ending up there in my head. Scene, scene, scene, story-worthy problem resolution, scene, surface problem resolution, the end. The only problem is, I want to bring this monster in at 80,000 words in order to make it easier to attract a publisher, and I’m seeing 120,000 words in my head, like everything else I end up doing. All that writing in 3rd person when I really wanted to do it 1st person (another thing the publishers like), for nothing. Right, so anyway, here’s my way of overcoming this problem of never having a plot until one falls in my lap. Make sure the little man you wedge the wax football into is the sturdiest little guy in the set. Make him so awesome-strange and compelling, your readers don’t care one bit what’s happening around him, just as long as they get to come along for the ride. Once you do that, all you have to do is forget everything I just said and make the plot rocks regardless of how you come up with it.